A book recently published in Tucson might hold a few local records, including one for youngest author: nine years old. But the real twist is that the author is a 10-pound Chihuahua. The World According to Jack is part memoir, part self-help and part humor. 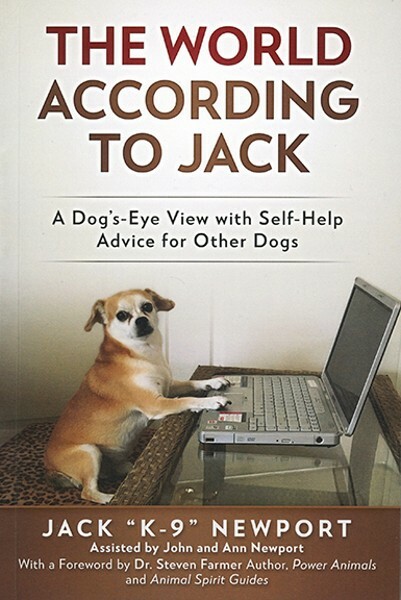 With writing "assistance" by Jack's owners, John and Ann Newport, The World According to Jack covers many of the typical aspects of dog life: trips in the car, going to the pound and being afraid of larger dogs. But that's only the beginning of the journey. The book gets much more interesting. John maintains that is the only book fully authored by a dog; just check the front cover or Amazon page. "The book naturally evolved as I wrote," John said. "I thought of what Jack would like to talk about, and the topics started coming out." A recurring section of the book is "Training Your Parents." Over its five parts, Jack explains how to pull off some supremely Chihuahua-esque things, including taking up all available room in bed and manipulation by guilt. In total, the book took a few years to write. The process involved John sitting in his office, channeling the inner spirits and thoughts of Jack. The duo were office mates through the entire writing sequence. "I spend a lot of time thinking, 'If Jack could talk, what would he be saying?'" John said. "It was a lot of fun, but also turned out to be a little bit challenging." The book is zany, but it also contains moments of lucidity with actual information in regard to the lives of dogs in Tucson. The World According to Jack has data on the Pima County Animal Care Center's numbers and operating styles, trips to the vet, canines' abilities to detect and quell health issues and more. "It involved a lot of online research, but some chapters were also experiential," John said. "When we first picked him up from the pound, I thought 'Oh my god, it's like they're in jail'. So I knew that had to be a chapter." And in an only-fitting conclusion to the book, Jack details his plans to run for the 2020 Presidential Election. Because, let's be honest, what other silliness would we expect from such a novel? The book argues that Jack is perfectly eligible for the presidency, has a better chance than many, and details his platform. "I also think Jack would make a good therapy dog," John said. "He just has a natural way of cheering people up. This book can capture the hearts of both readers and dogs." Jack even held a book signing for the recent publication. Last month, an animal shelter hosted his first book signing. While he isn't too dexterous with a pen, a paw-shaped stamp does the trick, and he's always up for more signings. Sure, John Newport wrote a book from the first-person of his dog, but he's not kooky. (At least not entirely.) Newport has a Ph.D. in public health from UCLA, and is a respected social commentator. He has also published books on addiction recovery and the shooting of Gabby Giffords. So why this humorous change in book topics? The idea formed when John and his wife took Jack on a morning walk. They talked about how funny the Chihuahua was, and how entertaining a book about him might be. "You're always doing these 'save the world' books," Ann told her husband. "Why not do a fun one?" And fun it was. But be advised, the book does come with a warning: If you are not a dog lover, you will be by the end of this book.